But now I see the importance. We need people to be aware, because we need a cure. We won’t find a cure till we invest in research. And our governments won’t spend money on research until they are put under pressure by voters to do so. At the moment there is precious little research being done on M.E., and that which is funded is being spent on ‘psychological management techniques’ rather than looking for biomedical causes and searching for appropriate medical treatments for this debilitating illness. We need people to say with us that this isn’t right. But I hope you are not saying that C.F.S. patients are not as ill as H.I.V. patients. My H.I.V. patients for the most part are hale and hearty thanks to three decades of intense and excellent research and billions of dollars invested. Many of my C.F.S. (M.E.) patients, on the other hand, are terribly ill and unable to work or participate in the care of their families. I split my clinical time between the two illnesses, and I can tell you if I had to choose between the two illnesses (in 2009) I would rather have H.I.V. Encephalo-myelitis = inflammation of the brain (encephalo) and spinal cord causing neurological symptoms. M.E. is thought by experts in the field to be an auto-immune/neurological disease, similar to M.S. There are some who think that it is caused by a retrovirus (like HIV) which attacks the brain, and there are others who think that it is more likely to be an autoimmune illness (like M.S.) where the body is attacking itself. Outbreaks and epidemics of the illness have been observed since 1934 and M.E. has been classified as an organic neurological illness by the World Health Organisation (WHO) since 1969. What are the symptoms of M.E.? The defining characteristic of M.E. is what is known as ‘post-exertional neuroimmune exhaustion’ (PENE). This means that after exertion (for a mild sufferer this could be a short walk, for a severe sufferer this could be something as little as concentrating on listening to a 30 second conversation) you have a relapse of symptoms which are neurological and/or auto-immune in character. The symptoms are often delayed by 24 hours or more, and then you get ‘payback’. For most people, physical exercise promotes health. For people with M.E., physical exercise (beyond their limitations) makes the condition worse. For example, I need to be in bed for most of the day. If I sit up for too long in a day, two days later, I might find that I have more pain, my heart randomly goes into tachycardia, my concentration is affected or my speech affected, I am short of breath on standing or I find that my legs give way if I try to walk more than a few paces. raised glands, a flu-like feeling, headaches, sleep disturbances, muscle twitching, severe food allergies, noise and light sensitivity, seizures, inability to express language (ataxia), difficulty swallowing, loss of temperature control, muscle paralysis. What treatments are available for M.E.? At the moment, despite having been classified as a neurological disease by the World Health Organisation (WHO) for several decades, the medical community is not very well-informed about M.E. A vocal minority of psychiatrists have obfuscated the issue, renaming it ‘Chronic Fatigue Syndrome’ in 1988, and using a more vague set of diagnostic criteria. They like to use the ‘Oxford criteria’ which just has ‘unexplained fatigue lasting 6 months or longer’ plus just one other symptom, as opposed to the more precise Canadian or International Consensus Criteria which focuses on endocrine, autoimmune and neurological symptoms. The Oxford Criteria is so vague that it is no doubt collecting together patients under the dustbin ‘chronic fatigue syndrome’ label who actually suffer from misdiagnosed depression, Lyme disease, coeliac disease, MS, or any other illness that has fatigue as a major symptom. Their claims that M.E. is a psycho-somatic illness (somatisation disorder) or similar to stress-related exhaustion has pushed back research for decades. As a result, when an M.E. patient goes to a doctor, they never know whether they will be treated seriously or fobbed off with ‘get out of bed and get some exercise’. The things that are most effective in helping an M.E. patient to recover are rest and ‘pacing’ (ie not pushing your body beyond its limitations). Unfortunately, because some psychiatrists believe the problem to be ‘exercise phobia’ and ‘false illness beliefs’ they recommend Graded Exercise Therapy (where you increase your exercise and ignore any symptoms you feel). Tragically, this and CBT (cognitive behavioural therapy) are currently recommended by the NHS as the best treatments for M.E. While CBT can be helpful in managing the condition (depending on how it’s done), Graded Exercise Therapy is the WORST thing that you can do for someone with M.E. and many patients have been physically damaged, often permanently, by this advice. Those with the best prognosis are those who are diagnosed early, who catch it while they are young, who don’t exert themselves beyond their limitations, and who REST, especially in the early stages. Combatting stress, cognitive therapies and building up activity levels, including physical exercise are good but only once the body has started to heal itself. Graded Exercise Therapy for ME is like physiotherapy after a broken leg – it is only useful once the leg has healed. If you try and force someone to walk when their leg is still broken, insisting that they are imagining the pain, they will never recover. On the most severe end of the scale patients are bedbound, unable to move themselves, often incontinent or having to use a commode, unable to tolerate light or noise and in constant, agonising pain. It is a living hell, and can last for decades. It is estimated that among the approximately 250,000 sufferers in the UK, a small percentage will make a full recovery, most will improve but not fully recover and some don’t improve. 25% of sufferers are housebound or bedbound. Although it is relatively rare to die of M.E., it can be fatal. There are two people I know of in the UK so far this year that have died of M.E. Severe sufferers Victoria Webster, aged 18 and Emily Collingridge, aged 30, both died of complications from M.E. in 2012. Emily had been ill for 24 years; Victoria had been ill, bedbound, for most of her life. You can read Emily’s story here . Many more deaths from M.E. go unreported. Typically deaths are from cardiac arrest, although renal failure is another common cause of death for those with very severe M.E. Sometimes people with M.E. are made worse, even fatally, by the supposed ‘treatment’ they receive from doctors. Sophia Mirza is one such example. She had severe M.E., and was bedbound. She refused treatment at a ‘CFS/ME’ centre because she knew that they used Graded Exercise Therapy to treat it. Because she refused treatment, they sectioned her and took her to a psychiatric hospital where she received psychiatric ‘treatment’ for her ‘false illness beliefs’. She never recovered. She died from M.E. and was the first person in the UK to have Chronic Fatigue Syndrome officially listed as cause of death. At the autopsy they found that she had dorsal root ganglionitis – swelling of the nerves near the brain, which would have accounted for her severe pain and neurological symptoms. This is consistent with the original hypothesis of M.E. involving inflammation in the brain (encephalomyelitis). Additionally there are those like Lynn Gilderdale for whom the pain of the illness becomes too much and they commit suicide. 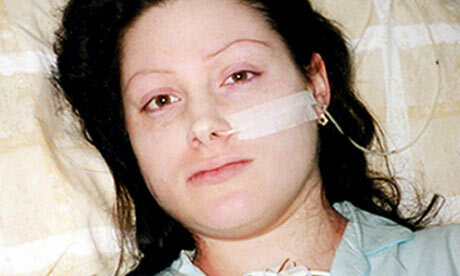 Lynn was ill for 17 years, bedbound, tubefed, unable to speak. Her mother helped her to commit suicide when she could bear it no longer. She was initially treated with Graded Exercise Therapy which made her worse, and she was also initially suspected of having a psychosomatic illness. At her autopsy they also found dorsal root ganglionitis, like Sophia Mirza. Their illness was proven demonstrably to be physical and organic in origin. I was not angry when I had glandular fever in 1996 in my late teens. I felt really exhausted and my sister had recently been diagnosed with glandular fever: could I have the same thing? The doctor scoffed and told me to do more exercise and then I would start to have more energy. A week later I saw another doctor. The tests confirmed that I did indeed have glandular fever (mononucleosis), and quite a severe case of it. “You need to rest as much as possible and whatever you do, don’t exercise. It’s the worst thing you can do with glandular fever,” she said. My glandular fever was very severe and I missed several months of school. From that time on I was prone to infections and even a slight cold would knock me out for 2 weeks. I was not angry when my M.E. was misdiagnosed as depression in 2005. At that time I was able to work full-time, but I was falling asleep in the afternoons – then one day I found that I was having strange cognitive symptoms. I couldn’t read even a magazine article – it didn’t make any sense to me. I knew it wasn’t depression – I had had depression before and I knew what it felt like. I tired rapidly but my mood was good and I didn’t feel depressed or ‘numb’. The doctor said it was probably depression and even if it were ‘chronic fatigue syndrome’ the treatment of graded exercise and antidepressants would treat both. I dutifully reduced stress, took antidepressants, gradually increased my exercise until I was running 5 miles, 3 times a week. Within 2 years I had had a major M.E. relapse and was in a wheelchair. I wasn’t angry in 2010 when they said that it would probably be fine for me to give birth naturally rather than have a C-section. The physical exertion of labour triggered a major M.E. relapse, leaving me temporarily bedbound and then subsequently housebound. The bout of glandular fever I had was the trigger for my M.E., though I was initially mildly affected. Then, like many others, I was advised to increase my exercise instead of resting, and my M.E. became severe. But then one of my friends got M.E. She contracted glandular fever while abroad and her body shut down and she found herself feeling constantly flu-ey and unable to walk more than a few paces. I was angry that she had to be ill for 6 months before she even got a diagnosis. I was angry that her diagnosis was not M.E. but ‘Chronic Fatigue Syndrome’, a ridiculously misleading name that trivialises what is a very serious and debilitating illness. I was angry that when she saw a physio they told her she needed to do Graded Exercise and bullied her into doing more stretching than she could manage and it set her back weeks in her recovery. l was angry that when she eventually does see a specialist, she may not see someone who accepts that M.E. is a physical illness. If she were lucky, she would see a doctor who would tell her she had a serious illness and she should rest and do the little activity that she was able to – and hope it improved in time. In other words, you get told ‘there’s nothing we can do’. That’s if she’s lucky. If she were unlucky, depending on what part of the country she was in, she would be seen by a psychiatrist who would dismiss her real physical illness as a psycho-somatic disorder that would be overcome if only she could decide to get better. I was angry that she could be potentially sectioned under the Mental Health Act for ‘false illness beliefs’. I was angry that if she were under 18 her parents would likely be investigated by social services for encouraging ‘school phobia’. I was angry that she was likely to have to fight for any sickness benefits she applied for, such is the skeptical attitude of the social services towards M.E. I was angry that she would be confronted with thousands of alternative therapies, all claiming to be able to fully cure M.E., all expensive, without any way of knowing whether they would help her or make her worse. I was angry that she could be one of the increasing number who die of M.E., without any chance of getting treatment, simply because the disease is not being taken seriously and there is a lack of research. There are some good and sympathetic doctors around and there are many people with ME who make full and fast recoveries. But the system is failing those with long-term or severe ME. So this is why I am using my limited cognitive energy this week to write a post on M.E awareness. I have finally got angry. I would very much like for you to get angry too. For more information on M.E. read The Hummingbird Foundation for M.E. For more information about what life is like as a severe sufferer, read Jenny Rowbory’s website or No Poster Girl. For help and advice as a sufferer, try the M.E. Association or Get Well From M.E. Write to your local M.P. requesting better biomedical research and treatment and adoption of the widely-respected International Consensus Criteria as a definition of M.E. to aid research and diagnosis. This post is my personal opinion based on my experience and reading and should not be taken as medical advice. If you suspect you have M.E. then you will need the advice of a good doctor. 36 Responses to Why should you care about M.E.? Hi Tanya, and thank you so much for visiting my blog and reading my piece on M.E. Awareness Day for this year (2012). I am going to link this excellent post of yours on my blog. Very well written, and it covers a great deal, especially the extremely poor treatment people with M.E. have come to expect. When I get round to it (i.e. have the energy which I am not using for other stuff I consider important, like my art and watching the Olympics lol!!) I am going to create a special page on my blog devoted to M.E. and hopefully link various articles there, and try and raise awareness through my blog. Keep up the good work. Somehow we’ve got to get the word out. I so agree – the more you protest that you do not have a mental illness, the more crazy they think you are and the less they believe that you’ve got a physical illness. Whatever you do, you lose. Hi Shoshi – thanks so much for stopping by at my place, and for your encouraging words. I am meaning to write a bit more on M.E. in the future; like you, my intention is to have a special page on my blog that is dedicated to M.E. Well, that’s the plan, anyway – as energy and time allows! Thanks for the compliment on my photo! It’s amazing what a tan and some make-up will do! I know well the ‘you’re looking well’ comments with the slightly inquiring/incredulous tone. I now just say ‘thank you’! It’s great to meet someone likeminded – I hope we can encourage one another. Brilliant post, thank you, I will share it. I had no idea ME was so prevalent in the UK – 1 in 250-300 people is massive. Someone should calculate the loss to the economy. That’s a good idea – I’m sure it’s billions. Thanks for your encouragement. Excellent piece of writing Tanya. I have had ME for 23 years. I am one of those who spent all my savings on trying every therapy and treatment I could to attempt to improve my deteriorating health. They didn’t work and I was left completely broke. I am one of those who has had to endure the disbelief, the stigma, the constant battle with the medical profession for understanding, informed views and proper care – which I still don’t have. My life has been wrecked by this illness. I have lost my home, my job, my relationship, I have not been able to have children. I am housebound and have no quality of life. Enough is enough. It is time this country started to treat us with the care we deserve and to fund proper bio-medical research – and SOON. I am writing this for you and for others like you who have been treated so badly. I’m really hoping that this will start to make a difference. It’s not much but we’ve seen in the past how things can suddenly shift when people make enough noise – so I’m doing the little that I can. So very brilliantly written! I’m going to share this on my facebook to help spread some understanding. And yup, I’m angry too! I will say I have been very lucky with my doctors and the doctors our Australian social security offices have sent me to (with a couple of useless exceptions in the hospitals!). But I’m angry that after twenty years it’s still hard to get even family members to understand that I can’t just get up and get going. Hopefully in this ME/CFS awareness week, and my unashamed flooding of facebook with every knowledgable blog, article, interview I can find, maybe it’ll help more people understand. Thanks again for this great piece! Well said, Tanya! And isn’t it the way that your anger wasn’t triggered until your friend fell ill? I know how you feel – if it’s *my* suffering, I just put my resources into dealing with it though it might be undeserved. But when it happens to someone else, well – somehow it’s easier to get angry at the injustices of the world than the injustices in my own life.